Welcome to 2017! Recap, Reading, and a Challenge. I know that many of us had a craptastic 2016, and I was no exception. To put it bluntly, there were far too many upheavals last year, and too many dramatics for me to consider it a good year. But. I learned a lot about myself over the past year, and while there were a lot of horrible moments, I am a much stronger, driven person than I was last year. I think I have finally found my voice, and in 2017, you're going to hear it. One of the biggest disappointments for me last year was my total disengagement with the online communities I have come to love so much. I became too consumed by things outside of my control, that I let go of the things that make me who I am. And a huge part of that is reading. At the beginning of 2016, I went 4 months without picking up a book other than the titles I was teaching. And I did it again in November and December. All told, I spent well over 5 months not reading. That's sad. So, on this side of 2017, I'm making it a goal to read more regularly and more diversely than I have the last few years. I have gone far away from the original purpose of this blog, which was reading the classics, and while I'm happy to be reading more YA, science-fiction, and fantasy, I need my classics back. I'm hoping I can incorporate more into my reading diet this year. My goal is 1 per month, but I think I can do more. One of the biggest things that I am continuing to work on is balance. Between home, work, personal goals, and adulting. I know that sounds silly, but I still struggle to manage it all. Quite frankly, there are too many things that I enjoy and not enough hours in the day to do everything. So balance is something I am continuing to work for this year. In terms of blogging, I've been saying it for what...3, 4 years now? But I would like to blog regularly. As part of that whole balance piece. Even if it is only 1 or 2 posts a week, I'll be happy. I know I will never return to the crazy blogger life I had prior to being a teacher, but I can do better. I will be better at it. 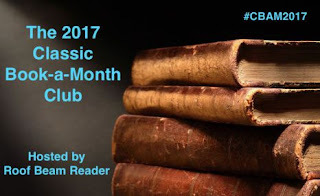 So, with all that in mind, I am joining one challenge for this year, which is Adam's Classic Book-a-Month Club. It's right in line with my goals-reading more classics. It will also include some rereads, which I am really excited for getting to this year. I love rereading, and like Adam, I include many books on my "Favorites" list that I haven't read in a long time.